The Yakima FrontLoader bike carrier is really easy to use, securing the bicycle securely by the front wheel and avoiding potential frame damage, and it easily accommodates different wheel sizes. 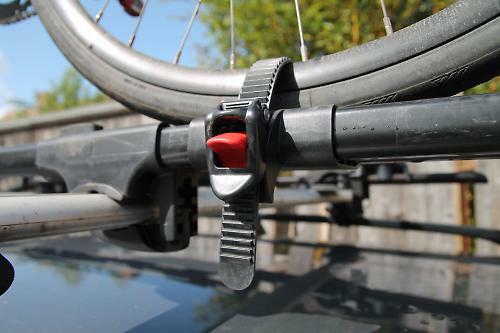 Unlike racks that clamp onto the frame, the FrontLoader has a two-piece contraption that at the front expands and wraps around the front wheel, while the rear section is preloaded by the large red dial, effectively clamping the front wheel in place. The rear wheel is clamped down onto a moveable tray with a ratchet strap. It creates a very secure and stable setup, so the bike doesn't wobble about. To avoid theft, or at least delay an attempt by a would-be-thief, a cable lock attached to the front section can be looped around the frame. The rack also locks to the roof bars for further security. The bike carrier is easy to fit to the car. It comes out of the box already assembled, so all you have to do is slide it onto your roof bars and lock it in place. There are instructions, but really it's so simple they're not necessary. It's easy to adjust the rack to accommodate different wheel sizes, from 20 to 29in. Tyre width is limited to about 2.5in, though, which rules out fat bikes, but road and cyclo-cross bikes, and regular mountain bikes, are just fine. Lifting a bicycle onto the top of a car isn't always that easy, especially a heavy touring bike or mountain bike. The Yakima helps here as the front wheel easily and quickly locates into the front hoop, and the rear hoop just needs to be pushed against the tyre. It's then held in place enough for you to concentrate on tightening it up. The Yakima is a really easy way to carry a bike on the roof of the car. It's stable and secure, there's no potential for frame damage, and it'll more easily accommodate any odd bicycle designs than racks that use frame clamps. This carrier fits around bars up to 88mm wide by 44mm deep, so it will fit all our roof bars." The adjustable wheel tray takes a range of wheel sizes, including deep section wheels up to 70mm. Takes tyres between 20' and 29', as well as 700c road tyres. Accommodates disc brakes, thru axels and full suspension frames. An integrated cable lock secures your bike to the rack while another lock secures the rack to your roof bars. The arms fold flat when you are not carrying a bike. Super-easy use and very stable. Brilliantly easy and stable, and there's no potential frame damage. Plus it's not limited by odd frame designs. Easy to set up and a doddle to use. Not very aero when folded down without a bike on top - the front section is quite bulky compared with a similar Thule roof rack. If I ever have to use a roof rack again I'll get one like this. My Thule one rubbed the paint on my Orange Five right down to bare metal. 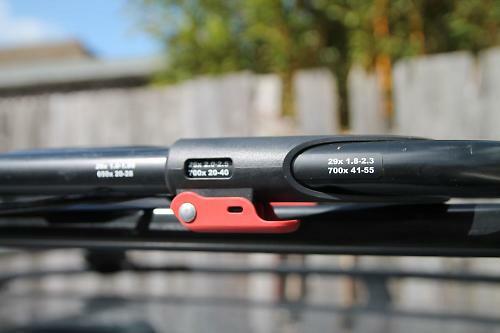 thule 561 is the best roof rack ive used. clamps the forks (stick the front in the wheel bag and pop it on the back seat). rock solid with zero wobble. will this fit on to thule aero shaped roof bars do you know? I have a thule 561 that is fine for the road bike, but utterly useless for my mountain bike as it has a lefty! After a LOT of research I got one of these last year and have never looked back. I fancied a fork mount version, but heard a few reports about them causing unnatural torsion through the forks in high winds/speeds. I got mine from Roof Box UK and the service was fantastic. Simple and quick to set up and no clamps around my nice Carbon frame. You will see a slight wobble, but that is intentional as it ensures there is no excess tension through the frame/forks. I've used on my sons 20" wheel bike too, and works a treat there. I'd be amazed if it didn't but email the guys at Roofbox.co.uk, they are great at coming back quickly with queries, and I asked all sorts of daft questions! This should please carbon bike owners who fear frame clamping will damage their bikes. Yes it does fit fine on the thule aero bars. Well the thule wingbars that I have anyhow! Brilliant Racks - I have three and having been using them a couple of times a week for about 4 years. Three is about the maximum number that can be fitted since they need to be completely inboard of the clamps on the roof racks. If you have a rear hatch, you will probably have to run the rack backways to stop the rear of the rack hitting when you lift the tailgate. I ended up cutting 20cm off the rear of one to allow my centre rack to face forward and have the handlebars not interfere with each other. 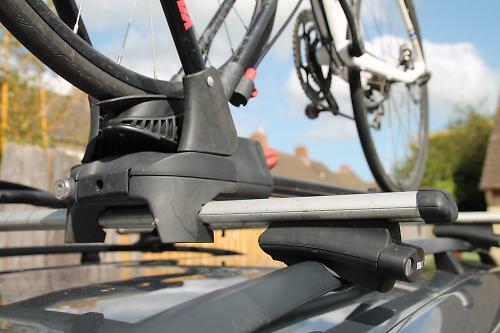 You really don't need to be too careful with clamping the bike heavily, the rack is secure with gentle pressure on the tyre. I have one of these and like it. Removing the front tire is a drag. The only case where it doesn't work well is with fenders. Looks great, anyone know how it works with mudguards? I've had one of these for two years. Holds my cyclocross bikes with mudguards no problem. Like others have said, quite long, so best to put them on with bike facing back of the car. But SOOOO easy to use and extremely well made. Lock is very secure too. Fork mount is the simplest and most elegant system and presents the smallest frontal area for least wind resistance, therefore better fuel consumption. I used these fitted to a home made tow bar bracket on my pickup truck for my mountain bikes.